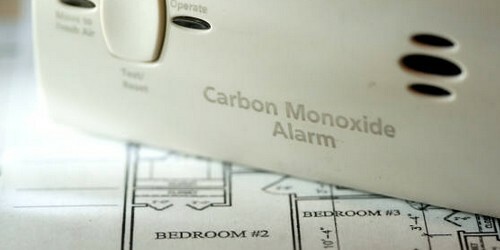 Are carbon monoxide (CO) alarms installed and maintained in your home? Often called the invisible killer, CO is an odorless gas created when fuels burn incompletely. The only way to detect CO is with a working CO alarm. Never use a portable generator inside your home, garage, basement, crawlspace, or shed or on your porch. CO can seep into the house through open windows, doors, or any type of vents such as for the dryer, exhaust fans, and even openings into the attic in the roof’s overhang. Use a portable generator outside only, and place portable generators at least 20 feet away from your house. Use outdoor-rated, long extension cords to run power into your home. Have your furnace, fireplace, and fuel-burning appliances checked by a qualified professional once every year. Never burn charcoal inside homes or in semi-enclosed areas. Don’t leave a car running in the garage. Install CO alarms on every level of your home and outside each separate sleeping area. CO alarms should have battery backup. Test CO alarms once a month, and replace CO alarms if they fail to respond correctly when tested. Know the symptoms of CO poisoning: headache, dizziness, weakness, nausea, vomiting, sleepiness and confusion. 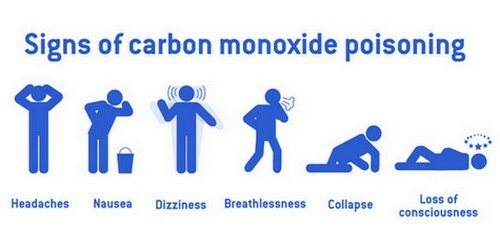 If you suspect CO poisoning, or your CO alarm sounds, get outside to fresh air immediately, and then call 911. If you live in an area without access to 911, call your fire department.